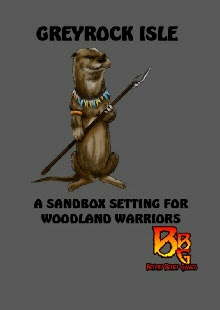 You also, however, get two new races to play as: hares and otters. Neither provides a wildly new experience, though both are welcome additions to the game. Then we get two new classes, the Talespinner and the Wayfarer. The first is a bard-like class, except in place of spells it has a handful of special abilities, including a Sanctuary-like ability to protect them. Unfortunately, the really good ability, Charm, only comes in at level 4, making Talespinners seem underpowered and somewhat useless when compared to the other classes. The second class, the Wayfarer, is essentially a monk with fur. Unable to wear armor it's AC advances per level and it receives a bonus to unarmed damage. It's nice, but nothing special. So overall, this is an underwhelming expansion. Aside from the two less than stellar classes, you get a setting that does little for an experienced GM, and a couple of extra races to play as. The second supplement is called Out West and clocks in at 30 pages. And it is radically different from the first expansion. Transporting the furry little heroes to the American West circa 1880, this supplement changes some of the WW fundamentals. Armor, for instance, is unnecessary as each class gains bonuses to their AC per level. And, of course, there are the guns. It wouldn't be the Wild West without six-shooters and scatterguns. And that lovely equalizer, dynamite. You also get re-skinned versions of all the main classes, including the two from Greyrock Isle, so you'll need that if you intend to play Talespinners and Wayfarers. There are small alternations, but nothing that significantly changes the gameplay. And there are two new races, prairie dogs, which take the place of Native Americans in the setting, and raccoons, which are just adorable. You also get a handful of new spells. The setting itself is fairly well-written and different enough from the previous two that it becomes worth a look. It presents a valley where the order of Good has less of a foothold and even the more "villainous" creatures take an active part in the growth of the valley. However, with the loosening of the strict Good and Evil mindset, it opens up a whole new world of gray area to play around in. Scoundrels and villains abound and fortune can often be found with the barrel of a gun. Frankly, that leads to the biggest disappointment of Out West. With the emphasis now on less definitively Good characters, you would think that new races would be introduced allowing for play as Foxes or Rats or any of the traditionally "villain" roles. Unfortunately no, although from what I've read they are added in the recently released At Sea supplement. So, are these two alone worth purchasing? That depends on how desperate for new settings you are. If it weren't for the new classes, I'd say that skipping Greyrock Isle was a safe bet. As for Out West, well if you really like a Western theme, then this one is a more palatable purchase. 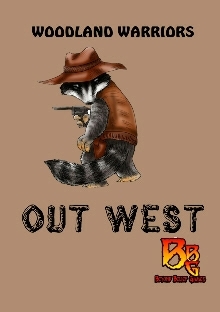 In fact, my group has almost exclusively used Out West during our Woodland Warriors games. 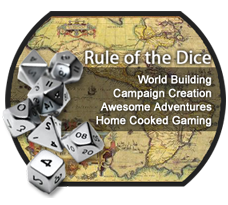 Still, both require you to at least be interested in the setting material, as there's scant new content you can drop into your own campaign setting. Of course, you could just purchase the PDF bundle and get the core game plus all three of its expansions. At that price, it's actually a really good deal. You can buy Greyrock Isle and Out West in PDF form from rpgnow, in a PDF bundle that includes the At Sea supplement and the core game, and in a spiral-bound print copy from LULU.